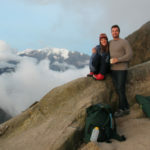 Kristen, Eirik and Lillian embarked on a 20-day trip of a lifetime last July. 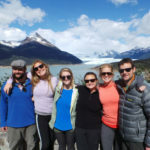 They explored a multitude of regions while traveling to Ecuador last summer, starting out at a phenomenal ecolodge in the Amazon Jungle, visiting Cotopaxi National Park, and enjoying time in the Galapagos Islands. 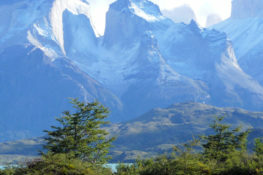 Read on for more photos and a full Ecuador trip itinerary. If you’re interested in an adventure to the Galapagos Islands and/or Ecuador mainland, contact a Knowmad Trip Specialist to jump start the collaborative planning process. 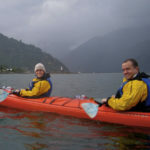 Enjoy a full day at leisure to independently explore Quito. Walk down quaint cobblestone streets lined with brightly colored colonial houses and balconies dressed in flowers. In Quito’s historic old town, you can visit the Plaza and Monastery of San Fransicso, Plaza de la Independencia, La Compañia de Jesús and the Colonial Art Museum. Today you will be heading to the Amazon. There is a 10 pound limit per person for your luggage, so you will pack only what you need into a separate bag, and leave the rest of your luggage with our team to lock in our Quito offices. Leaving the bustling metropolis of Quito, you will be treated to the beautiful scenery of the Ecuadorian countryside on a drive through the impressive Avenue of Volcanoes, lush green landscape punctuated by tree ferns, patches of cloud forest, waterfalls, and rushing rivers. As the air grows warmer, you’ll start to notice changes in vegetation with bananas and tropical palms dominating the countryside. The drive eventually ends at Shell, a principal Amazonian town named after the oil company with the same name, where you will board a small plane, flying for 35 minutes to the Huaorani community of Quehueri’ono (keh-werioh- noh). After being warmly greeted by the Huaorani people from the community, they will take you downstream in a shallow dugout canoe called a quilla (kee-yah). Keep your camera, binoculars, sunscreen and hat with you because your luggage will be taken to the lodge in a separate boat. Rubber boots and rain ponchos will be given to guests at this time. As you travel down the beautiful Shiripuno River, keep binoculars and camera ready for such birds as striking Yellow-rumped Caciques, kiskadees, kingfishers, and egrets among other species. Upon arrival you will get the chance to settle in and have lunch before taking a short hike on the rainforest Discovery Trail. On this walk, you will learn about the Huaorani culture and the surrounding Amazon rainforest. Today you will get a chance to get to know the Huaorani people. Huaorani survive in the forest by hunting monkeys, birds, other animals, fishing in the river, and gathering fruits, tubers, and vegetables. While you will learn about basic hunting techniques, no animals will be killed. One of the main goals of this project is the preservation of traditional Huaorani practices to keep Huaorani culture alive and protect the rainforest. The local guides will teach you how to set traps, make fires without matches, build a quick jungle shelter, use a blowgun, swing a machete, and catch fish in small creeks. Your guide may also show you which insects can be eaten, identify medicinal plants and explain their uses, and show you where they find clay for making pottery. a bowl of “chucula” (a sweet drink made from ripe bananas) and admire beautiful handmade artifacts such as woven hammocks and bags, traps, blowguns, and necklaces made from jungle seeds. You will also have the chance to visit the Bi-cultural Ecology Education project and learn how to harvest manioc, a Huaorani staple. At the end of the afternoon, a pleasant canoe-ride takes you back to the lodge for a relaxing evening. Today you will venture on a three-hour walk through primary forest with immense towering trees, crystal clear streams, and a myriad of bird calls from the jungle. The trail leads to a hilltop crowned by a massive Ceibo tree over 40 meters (131 feet) tall, then follows a path that parallels the Shiripuno River and crosses small tributaries, including one that occasionally hosts groups of White-collared Peccaries. You will probably see tracks of these wild, rainforest hogs, may smell them, and might even glimpse them. You will also see a huge Leaf-cutter Ant nest before reaching a small oxbow lake. A walk along the lake leads to a river where a canoe will take you back to the lodge. After a delicious lunch at the lodge, you will canoe back downstream to an oxbow lake known as the “Cocha Pequeña”. At the lake, you will have a very good chance of seeing the extraordinary Hoatzin (one of the few birds that feeds almost exclusively on leaves), Squirrel Monkeys, Capybaras (the world’s largest rodent), Caimans, and might even see an Anaconda. On the way back to the lodge, stop at a salt-clay lick that is often used by various animals and birds. This is an excellent site for viewing rare wildlife and birds as many animals gather here to feed on the mineral-rich clay. On the way back, begin to spot nocturnal wildlife before a relaxing evening at the lodge. After an early breakfast, canoe down the Shiripuno River in traditional Huaorani style as the sun begins to rise and the mist dissipates. The tranquility of the morning will allow you to appreciate the true peace and calm of the rainforest, and is the perfect time to relax and engage in intimate conversations, reflect on the past few days of the journey, or to learn some Huaorani vocabulary. On your ride downriver, visit the Apaika community, a Huoarani community found inside the Yame Reserve. Enjoy a quick snack and visit a small interpretation center to learn more about Yasuní National Park. The afternoon is topped off by getting together with the local community to share in some of its daily activities and learn about their history, myths, and magic. After leaving Akaipa, the next stop is the small Huaorani village of Nenquepare. You will spend the night here camping out in comfortable, fully serviced tents that are part of a community initiative. After another delicious breakfast, you have the chance to hike a community trail to see an impressive tropical waterfall, seeing various plants and animals on the way. You will also learn about why this waterfall is of special importance for the Huaorani people. At the waterfall, you can take a dip in the energizing waters. After returning to the campsite on the Shiripuno, you will continue on downstream by canoe to the infamous “Auca Road”. The Auca Road was built by oil companies in the early 1970s to search for oil on Huoarani lands. As you travel along the Auca Road, you won’t help but notice the stark difference between intact rainforest and deforestation that occurs when roads are carved out of the surrounding jungle. This part of your tour illustrates the reality of the threats facing the rainforest and the Huaorani people as much of the road passes through land that was formerly forested and lived in by them. It will also help you realize why your visit to Huaorani Lodge was so important! After a 2-hour overland ride on the Auca Road, you reach the town of Coca and the place where you catch your flight back to Quito. Upon arrival in Quito you will be met by a Knowmad Adventures representative and transferred to your hacienda in Avenue of the Volcanoes. Enjoy a full day at leisure to independently explore your hacienda and the areas nearby. Today your guide will meet you at the hacienda and you will go by vehicle into the national park where you will visit the interpretation center, Limiopungo lagoon for bird watching and a light hike, and more. You may also have the opportunity to hike to a nearly 300-foot waterfall on a scenic trail as well as other activities throughout the park and nearby area. Today you will be picked up at 5:30 a.m. and taken to the Quito airport for your 9:30 a.m. flight to the Baltra Airport in Galapagos. The flight from Quito to the Galapagos is approximately 2 hours on a Boeing 727. Upon arrival at 11:30 a.m., travelers pass through an airport inspection point to insure that no foreign plants or animals are introduced to the islands. Your park entrance fee of $100 and $20 for the INGALA card, which is an identity card that you need, will have been pre-paid. A representative from Knowmad Adventures will meet you and take you to your accommodations in the town of Puerto Ayora. Today Eirik will go scuba diving (arranged independently by client) while Kristen and Lillian can explore town or relax on the beach. Today you will be transferred to your cruise. A small boat, called ‘Panga’ (dinghy) will transport you to the M/C Anahi, where the crew will welcome you onboard. After departure and lunch, you will proceed to the first visit. The Gemelos (twins) are two deep craters located to the side of the road that leads to Puerto Ayora from the other side of the island. These huge holes were probably created in a volcanic explosion or by magma chambers underneath the island ́s surface. This is also a good place to see the Galapagos hawk and barn owl of this island and the surrounding forests are filled of birds such as the vermilion flycatcher or the yellow warbler. A beautiful place reached by a nice panga ride, “Tintoreras” are small islands in front of the coast of Puerto Villamil. Here, we find lava herons on the mangrove branches and Galapagos penguins and sea lions often popping out on the shore. White-tipped reef sharks (called tintoreras in Spanish) are also fairly common in this spot, hence the name. The Wall of Tears is a very important historic site in Isabela. Between 1946 and 1959 Isabela Island was a penal colony, and prisoners here were forced to build a wall with huge blocks of lava as a punishment. The wall is 100 meters long and 7 meters high. Because of the arduous labor and harsh conditions in which the prisoners lived and had to work, this site is known as the wall of tears. A set of stairs provides a good viewpoint of the wall and the surrounding landscape. It ́s still possible to see the cement foundations of the USA military base that dates from the Second World War. Isabela Island is one of the youngest and the largest islands in the Galapagos archipelago. We will do a dry landing in Puerto Villamil, the second smallest town of the Galapagos, with approximately 3,000 habitants. We will head to the highlands, to Sierra Negra slopes, to then do some hiking on uneven terrain to reach Sierra Negra volcano ́s rim. Sierra Negra volcano has the second widest crater in the world. From this natural viewpoint, we will have fantastic sights of the truly gigantic crater, the rest of the volcanoes, and Perry Isthmus, a 12 Km wide lava field. From here we can hike to Volcano Chico, to watch the outstanding lava formations, examples of the geological events that have crafted the Galapagos Islands. Punta Moreno is located on the north coast of Isabela Island, between the Sierra Negra and Cerro Azul volcanoes. The trail runs along a Pahohoe lava (solidified lava in corrugated or accordion shapes) flow into a complex of coastal lagoons, where we find several species of birds around the mangroves that complete the landscape. This is a marine visitor site, so, the excursion is carried out on our panga as there is no landing point. The panga ride starts with a visit to Marielas islets, to see the largest and most important penguin colony of the Galapagos. The ride continues into the cove, which is surrounded by magnificent red mangroves, with their red roots and green leafs. Here it is possible to observe sea turtles, flightless cormorants, spotted eagle rays, golden rays, brown pelicans, and sea lions. Some days, we have been able to see Galapagos hawks soaring overhead while schools of Pompano and Dorado fish swim below. South from Tagus Cove but still on the west coast of Isabela we find Urbina Bay. An easy wet landing on a mild sloping beach will take us to a very interesting area that it is a perfect example of the geological activity of the islands. The waters on this site are a good place to see turtles and rays and we will take a short trail that leads to a coral reef, which is evidence of an uplift from the sea floor that occurred in 1954. From here it’s easy to reach the Alcedo and Darwin volcanoes. We will see large and colorful land iguanas and have excellent possibilities of seeing giant Galapagos turtles, flightless cormorants, blue-footed boobies, Galapagos penguins, pelicans and marine iguanas. A panga ride along the cliffs will give us a good chance to see the Galapagos penguin, the flightless cormorant and other sea birds. From the landing dock we will walk for about 30 minutes along the trail to reach the top of the cliff, from where we will have a great view of Darwin Lake, an uplifted ultra saline lake, saltier than the sea and other several volcanoes. Look carefully at the inscriptions on the surrounding cliffs of the cove, these has been written or carved by pirates, whalers and buccaneers in past centuries. Fernandina is the third largest island in the archipelago and has just one visitor site: Punta Espinoza. This site is located at the northeastern point of the island, just across Tagus Cove, and is a perfect place to see some of the unique species of Galapagos. Marine iguanas join in larger groups than in any other island. They bask around in the sand, swim near the shore, and sometimes, they block the way at the dock. Among the unique species found here is the flightless cormorant, a bird that because of the lack of predators had to adjust its way of survival, enhancing its swimming skills to find food in the ocean. Its wings, tail, and feet progressively adapted for swimming, but lost the ability to fly. Evolution happening right in front of us! At Punta Vicente Roca we find the remnants of an ancient volcano that form two turquoise coves with a well protected bay from the ocean swells. The spot is a popular anchorage area; from here we will do a panga ride along the cliff (the remains of the volcano) or explore a partially sunken cave. Nazca and blue-footed boobies usually sit perched along the cliffs, while flightless cormorants inhabit the shoreline. The upwelling of coldwater currents in this area of the Galapagos give rise to an abundance of marine life, making of Punta Vicente Roca one of the archipelago’s favorite dive spots. One cove is only accessible from the sea by an underwater passage. The passage opens to the calm waters of the hidden cove, where sea lions lie lazily on the beach after swimming the underwater route. The excursion in Puerto Egas, with its black sand beaches, is considered one of the more rewarding visits of the Galapagos. In the 1960s, this island was the site of a small salt mining industry (one of the several unsuccessful attempts to create a profitable industry in Galapagos). A hike to the salt crater presents us with a very good opportunity to watch land birds such as finches, doves, and hawks. A walk along the rugged shoreline while the tide is low will let us see many marine species, like Iguanas basking on the rocks or sea lions laying lazily in the tide pools. At the end of the trail we will find a series of grottoes (sea caves carved on the lava by the waves), where fur seals and night herons are usually resting on the ledges, protected from the sun. 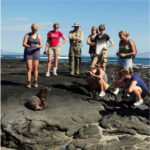 For many visitors, this is the only opportunity to see the Galapagos fur seals, once thought to be almost extinct. This is a small islet of approximately 1 square km, located just off the southeastern shores of Santiago Island. It is a recent volcanic cone with a shape that resembles Chinese, hat when seen from north side. On the west side we will see lava formations, which were formed under the sea and then raised above the surface, exposing coral heads that were on the lava. This is an excellent opportunity to get a better understanding of the geological features of the islands, such as lava tubes and flows. The landscape is completed by a sea lion colony, lots of marine iguanas, and Galapagos penguins. A small, barren island located just across from Sullivan Bay (Santiago Island) and with two main visitors’ sites. The first one offers us the possibility of climbing to the summit of the island, where we can enjoy a superb view which includes a variety of volcanic formations: lava bombs spatter and cinder cones and lava flows and tubes. The lunar landscape provides one of the most scenic panoramas of the archipelago. The second site gives us a chance to relax on a beautiful beach with great snorkeling opportunities: Multicolor fish penguins and sea turtles can usually be seen at the base of the tall pinnacle rock, which dominates Bartolome’s landscape. A short walk to Bartolome ́s second beach, in which swimming is strictly forbidden, will grant us a good chance to see white- tipped reef sharks swimming along the shoreline. This is an uplifted island that presents a flat landscape strewn with boulders. Here, we also find a large population of magnificent frigate birds and blue-footed boobies nesting and performing their courtship rituals. Despite the tremendous surf that usually pounds the outer shore, we can also find sea lions hauling out onto the beach and doing bodysurfing. 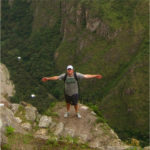 After this visit you will transfer to the airport for your flight back to Quito. Today you will be picked up at your hotel in accordance to your morning flight home.